This very clean 1973 Plymouth ‘Cuda arrived at the V8 Speed & Resto Shop in need of an underhood makeover. The car is wearing its original color, a nice shade of B5 blue capped with a white vinyl top and blue interior. The exterior presents well, and the silver rally wheels and polished trim rings offer nice contrast, but once you open the hood the magic goes away. Click "Read More" for the complete photo gallery! Contact the V8 Speed & Resto Shop with all your Classic or Muscle Car needs today! We enjoyed refreshing this 1979 Chevrolet Bonanza Pickup! This one is still in it's original family, and we're honored to have had the opportunity to give it a repaint and make it look new again. We fixed some rust in the floors, rockers, and cab corners, and resprayed it in it's original color. Lots of restoration parts form Classic Industries helped make it fresh. New interior items include Dynamat sound deadener, new dash pad, door panels, carpet, and weatherstripping. It's not a high-profile show truck, but it means the world to our customer, so it means the same to us! Thanks to the owner and to the V8 Speed & Resto Shop crew for returning another classic to the road! This 1966 Pontiac GTO is a beautifully restored car, but the owner wanted to upgrade the braking performance a bit with some new disc brakes. He also wanted the ability to change the look of the car without doing any permanent modifications, so the Goat got a new pair of shoes. Here, the V8 Speed & Resto Shop Crew installs a new power disc brake kit from OPGI and adds a set of 18” Rocket Racing Booster wheels wrapped in Diamond Back Classics goldline tires made by Toyo Tires. Now, the GTO stops easier and can wear the original Rally 1 wheels or switch to the Rockets for a split personality. General Motors "G" bodies, Buick Regal, Chevrolet Monte Carlo, Pontiac Grand Prix, and Oldsmobile Cutlass cars from the 1970s and 1980s are great candidates for modern power and performance upgrades. This cool 1985 Chevrolet Monte Carlo SS has been in our customer's family since 1986 and is now ready for a modern GM Performance Parts LS3 V8. Click "Read More" for the complete photo gallery! This clean 1965 Ford Mustang came to the V8 Speed & Resto Shop for some mechanical and performance upgrades. The car will receive some new rear gears and a Borgeson power steering gear upgrade. Click "Read More" for the complete photo gallery! This 1973 Pontiac Trans Am was restored at a different shop, but out customer brought it to us to complete some final details. It's a beautful Buccaneer Red 455 car, and we were happy to put the finishing touches on the car to make it drive and perform as good as it looks. NEW V8 Speed & Resto Shop Black "You Dream It!" Tee Shirts! Sizes S - XXL, all SAME PRICE! 50/50 Cotton Polyester Mix. 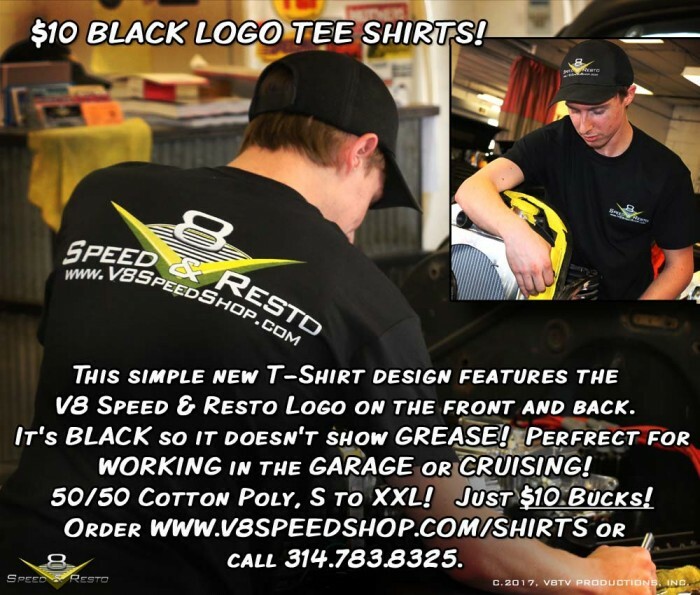 NEW V8 Speed & Resto Shop Black Tee Shirts! Sizes S - XXL, all SAME PRICE! 50/50 Cotton Polyester Mix. 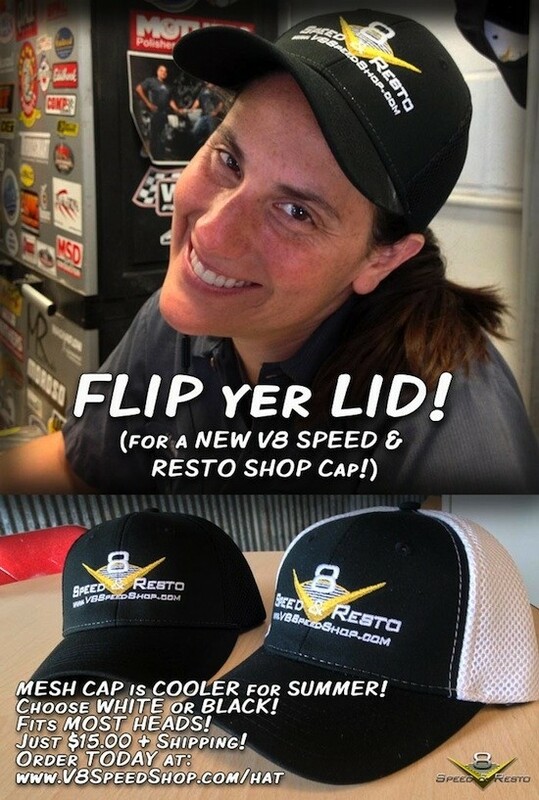 V8 Speed & Resto Shop Mesh Hats! Black or White!